Over a dozen parks and preserves protect hilly, desert areas in and around Phoenix, ranging from relatively developed places, wholly or partly surrounded by the suburbs, such as South Mountain or Camelback Mountain, to larger, more pristine regions further from the city. 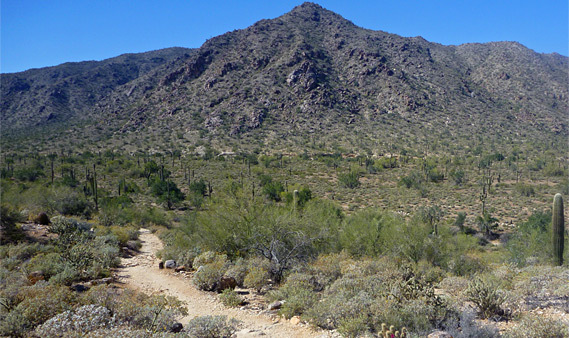 White Tank Mountain Regional Park is one of the latter examples, covering 46 square miles; the northern half of an isolated range 25 miles west of downtown Phoenix, close to Buckeye, Surprise and Waddell. 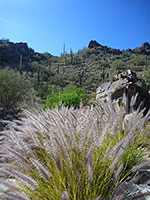 Whilst no different in character to most other mountains in the Sonoran Desert, the place is still very scenic, largely unspoilt, and has several long, little-used trails that climb high into the hills, passing a great variety of wildflowers and desert plants. The entrance road runs only along the edge of the park, while the trails penetrate less than half way across; the remainder is essentially pathless and so rarely explored, but even so there is enough to see to occupy at least two days. Other park facilities include a family campground, a group campground, several picnic areas, a nature center and a dedicated network of cycle trails. Olive Avenue is the one road to the regional park, leading westwards from Peoria. West of Youngtown and the Agua Fria River, the surroundings are mostly agricultural, and for ten miles the route encounters scattered farms and just a few new housing estates, heading towards the low mountain range, which is visible for a long way across the Phoenix suburbs. The road passes the park boundary, the entrance station (fees $6 per vehicle in 2015), and a large building containing the nature center and library, then bends round to the north, across plains and low hills for another 3.5 miles, ending at a large dirt parking lot for the cycle track network. 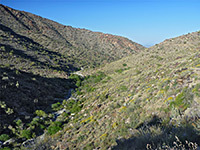 Two short loops branch off (Black Canyon Road, Waterfall Canyon Road/Ford Canyon Road), and along all roads are many parking places, three groups of picnic ramadas, and about a dozen trailheads. 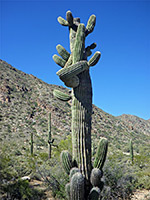 The main campground is on flat land towards the north end of the road, the sites quite well separated and surrounded by plenty of large cacti, most noticeably saguaro and several species of cholla. Besides camping and picnicking, the main activity in the regional park is hiking. There are 13 named trails, all intersecting, so many different loops are possible, ranging from half a mile (Black Rock Short Loop), to 17 miles (Goat Camp, Ford Canyon and Mule Deer). The majority of the paths are fairly level, and generally short, easy and not too interesting, crossing the bushy desert close to the park road, but much more challenging and varied are the four which climb into the mountains. Of these, by far the most popular is the 0.9 mile Waterfall Canyon Trail. 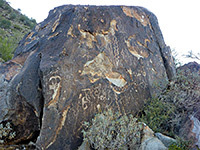 This is level and paved for the first half mile, marked by a few interpretive notices about local history and flora, as far as a fenced-off area containing about six large boulders adorned with dozens of ancient petroglyphs, many large and crisp. Just beyond is a ramada at the start of the final 0.4 mile section of the trail, which is a little rougher and narrower, following close to a bouldery wash to the point where it drops from a high, unclimbable ledge, site of a seasonal waterfall, only evident in spring and sometimes in late summer after stormy weather. A pool persists at the base of the falls for a long time after the stream stops flowing. 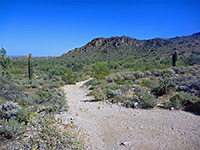 The other three routes into the mountains are significantly longer; the 6.3 mile Goat Camp Trail follows a drainage then a ridge to a three-way junction with the other two paths - Mesquite Canyon Trail (5 miles) and the Ford Canyon Trail (7.4 miles), both of which encounter a similar mix of landscapes. 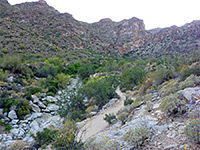 The 1.6 mile Willow Canyon Trail provides an alternative connecting route and hence there are six options for a loop hike, and as good as any is the 9.6 mile circuit involving the Waddell Trail, most of the Ford Canyon Trail, the Willow Canyon Trail and the lower section of the Mesquite Trail. This map shows the east-central section of the regional park, which extends another 1.5 miles west, and a shorter distance north and south. The Maricopa County website has some good maps of the park.